Although rumours abound of a motion-enabled successor to the DS being readied for unveiling in the near future, it seems some developers just couldn't wait and decided to attempt the same kind of game mechanics afforded by accelerometers utilising the second camera present on the DSi. The system is known as "head tracking" and in this game, Rittai Kakushie Attakoreda, uses a facial recognition algorithm to adjust a virtual 3D image as the player tilts their DSi in order to find various objects hidden in a virtual world. It's hard to put the effect into words, but it's almost like your DSi has become a window into a paper diorama filled with animated characters. 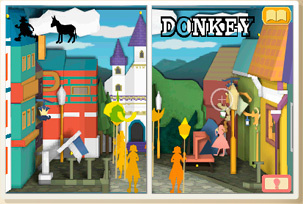 You're tasked with finding letters that spell words as well as other characters simply by tilting your DSi back-and-forth to cause parts of foreground objects to line up with background ones, thus forming the required images. 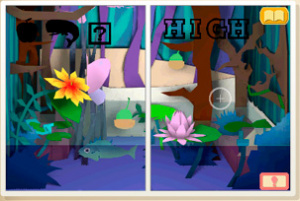 Once you have an image in sight you move a cursor using the D-PAD and then press a button (or tap an icon on the touchscreen) to register it, with the goal being to find more than a dozen words and scores of other images in multiple dioramas. Where did that donkey go? Whilst holding the DSi vertically and using the D-PAD can be cumbersome, it's not a game driven by reflexes. It is something of a tech demo, but many of the objects are quite challenging to find so there's definitely an actual game here. The only serious problem is the requirement for good lighting conditions. Even in lighting good enough to read by it can be impossible to get your face recognised against the background and you must re-calibrate every time you play. In addition to good lighting you'll also need to keep your DSi about 30+cm away from your face to ensure there's enough background to discern the outline of your face; obviously you'll also need to keep the same pose/orientation towards the screen - though you can re-calibrate mid-game if required. We're happy to present a video preview of the title in action which should hopefully make much of the information above a little clearer. Enjoy! I didn't try it on a surface, mainly because the DSi doesn't lie flat, but I'll give it a go. I think it would be a problem because you need to be squarely looking at the camera, so the angle would be really awkward - you'd need to be bent over the top of it. I had no luck finding out what Attakoreda means, but kakushie apppears to be "sly picture" - according to Google Translate (I know, I know). Kakushi = "sly" - probably not an accurate translation - and the kanji "e" (ay like "hay") is "imaginary," but it can also mean picture (though that would be pronounced "kai" which is what I originally had in the news article until I had the game and saw the furigana actually uses the "e" reading). Attakoreda could be a "Japanese English" word, maybe Art Corridor? I'm hoping to get the biplane game that also seems to be using head-tracking and do a video this week-end - keep watching! Oh, and thanks, the cat's name is Jeremy; he was lying with Samson, who was just out of frame. Looks new, creative and fun! Hope to see it (or something like it) soon! Looks cool. Couldn't see well, but seemed to have a 3D feel when you moved the dsi and the angle changed in the environment. @Sean: So THATS what you sound like. Edit: heh. I didn't even see the cat at first. Well there's already games that do the same basic thing on iPhone (via a combination of camera and tilt sensor no doubt), so the DSi isn't really breaking new ground as such, but it's still cool. As a side note I actually think this game would be better suited to the iPhone anyway because as the iPhone a single screen touch screen device it makes sense to let the player move the cursor with touch and interact that way whereas on DSi it creates a conflict since there are two screens and only one of the screens is touch capable so it would seem weird to be able to select the letters by touching on one side of the image and not the other. iPad...now that would be PERFECT for this type of game! I wonder how well face recognition on the DSi works for people with dark skin..
Man, the cat really scared me when it started moving. Cool. I remember u guys mentioing this to us in an earlier article on here. Your finger and hand would get in the way on an iPhone version. @Chibi Link: I've just tried on table-top and it's not workable. Because the DSi doesn't lie flat you not only need to have your head at an unnatural angle, but then keep it that way. As noted in the text above you also need to be about 30cm away from it, so it's just really too awkward to play it that way. @Kimiko: I don't think that's an issue. I'm not sure how it works, but today I'm wearing a white shirt (certainly lighter than my own skin tone), yet the program still had no trouble highlighting my face - note also that I have very dark hair, yet in the video (and other times) my entire head is highlighted. You're prompted to be a certain distance and have the bounding box in a certain place on your face so I suspect the software is looking for more than simple light-dark contrast. I'm surprised at how smooth it actually works. I'd happily pay 1000 points for this if there was a healthy amount of content. Thanks for the review Sean. It was fun to watch ... and see part of your cat, too. It's only 500pts Jampony, so a bargain in your eyes? It works well - provided the lighting is good; poor lighting and it all goes to hell or won't even let you get past the photo-taking stage. Thanks Victoria, but remember it's only a preview, the review will be done by someone else if/when it comes out in other territories (which I think is almost a foregone conclusion). I thought that was an animal shaped throw pillow until the end. That's cats for you, I suppose. Anyway, it certainly looks interesting. Yeah I heard about this game a while back and had some ideas for what they could do with it.. For example, a Mario game. Where you have to jump from one panel to another but the platforms are not there until you tilt the DSi. so you might jump towards nothing but as you tilt, the ground forms similar to this game. and it can also be a side-scrolling environment but with a diorama feel. Whoa, that is some awesome tech! I hope it comes over here. For 500 points, I'd get it day 1. Nice video preview btw. Looking for coins is fun which you can use to buy hints, though as I note (in an edited bit) the hints are in Japanese, so useless - unless you can read it. Can your next video include you playing with your cat? Cool idea! I'm surprised that Jampony would pay 1000 points for it because it looks like I think that 200 or 500 is reasonable for this. Could be to make it look "cool" - that could also go along with writing it without any kind of spacing between words (though that's not all that unusual). I've seen games where English-origin words have been written in hiragana as well (though these might be ones targeting kids who may not have learned katakana yet, it being the second writing system taught in schools). now, the ds COMPLETLY PWNS the psp. this looks awesome. and it could be used with other games too! also with the new processor, the games can be better and be nicer and smoother to play. this is amazing! So those were the cats who made statements like "Meooww" and "Mweoow" in the background while we were playing the Conduit last summer . Also great review Sean! You can easily see the 3d effect from the video, which would be impossible to show in static images. Effect looks pretty much same as the Johnny Chung Lee's head tracking demo back in 2008. Hope this will be soon available in EU, US and Australia. The little flag is a lie! Shhh......He's infiltrating society over there to report back to us. I had to watch this video twice! One may think because this looks very fun, new, and innovating, which is true, but no; it's because of your cat. The cat distracted me the whole time I watched the video the first time. The idea of face tracking sounds good, but I'm going to skip over this one. The object finding sounds boring, and there are already 2 examples that show the DSi camera is terrible when it comes to head tracking (WarioWare: Snapped! and Move Your Brain). P.S. I thought the cat was your head until I read the comments XD. The secret is out: I'm really an American cat-girl. Wow, the game looks even better in a DSi XL. Too bad we can't transfer purchases between systems as that would make me go out and get an XL. Is this on the DS? Or the 3DS?